Product Features 24 holes harmonica, Octave Stainless steel cover plate Key of C Body Material: Plastic ​ Product Description 24 holes, Octave, harmonica. Key of C. Slim and beautiful design. Length of 18cm. Nice and high quality tone. Stainless steel cover plate, solid brass reed plate, plastic comb. Dynamic range and high volume. Manufactured with quality craftsmanship. 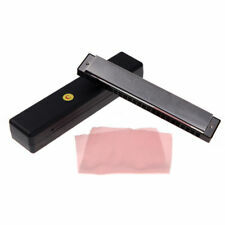 1x Polyphony Harmonica. - Material: aluminum alloy and plastic. - Color: Silver，，. 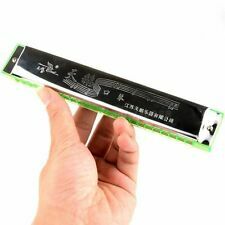 Suzuki Study-24 is high quality 24 holes, tremolo harmonica, key of C, made of eco-friendly resin frets, it features phosphor bronze spring, stainless steel cover. 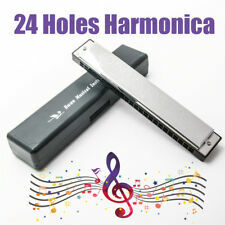 Exquisite 24 holes tremolo harmonica, key of C, with abundant sound. The cover plates, the reed plates, and the wood comb had been disassembled and detail clean.The wood comb front had been partially sealed with clear paint coating. The screws and nuts had been replaced with a set of better than the original ones. Great sounding and playing classic Brazilian Octave tuned harp. 40 hole in the key of C. NOS from the 90's, these are no longer available new. 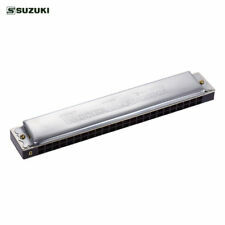 The Suzuki harmonica's laser tuned reeds are extra lightweight to give that special harmonica octave effect. 2 or 24 dual-hole octave/tremolo tuning. Extra lightweight laser-tuned reeds. Limitations and Exceptions. 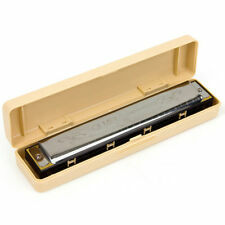 Hohner Kreuzwender Tremolo Harmonica, great for all traditional folk music styles. It has not been play tested. Includes case but may not include original box. This item is sold AS-IS and does not include warranty. 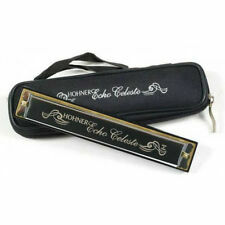 Great sounding and playing classic Brazilian Octave tuned double harp. 96 hole in the keys of C and G. NOS from the 90's, these are no longer available new. 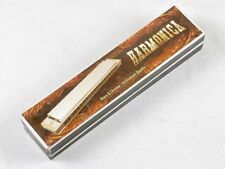 Hering Sonhadora Harmonica Made in Brazil in Original Box. Condition is Used. Harmonica is quite worn with scratches, possibly rust, some dirt, a few dings in metal as shown in photos. I tried to take pictures as clesr as possible to show this. Box also quite worn and weathered. 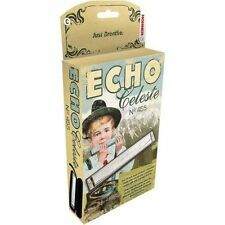 Harmonica is well used, sold as-is! 4005 N Norfleet. (Your RA #). Check-Out Now! New Gear: If you’re not satisfied, neither are we. It’s that simple. Great sounding and playing classic Brazilian Octave tuned harp. 32 hole in the key of C. NOS from the 90's, these are no longer available new. Traditional Tremolo harmonica with SEYDEL's unique Stainless Steel reeds. 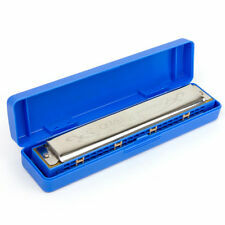 The SAILOR STEEL Richter-tuned Tremolo is the first traditionally-shaped tremolo harmonica with stainless steel reeds. If a single note is played two reeds that are tuned a little bit different start to operate together. 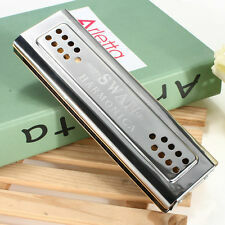 The SKYDIVER STEEL TREMOLO is a traditionally-shaped tremolo harmonica with stainless steel reeds. Limitations and Exceptions. If you’re not satisfied, neither are we. It’s that simple. Box has wear. I try to be thorough and check everything but I am not an expert. 1990's model of the 48-hole straight Echo, then made in the Czech Republic. Like new condition. NO SALES to STATE of MICHIGAN.. 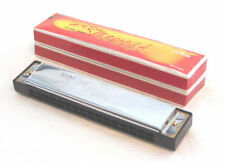 Traditional Tremolo harmonica with SEYDEL's unique Stainless Steel reeds. 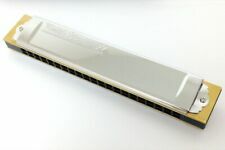 The SAILOR STEEL Tremolo is the first traditionally-shaped tremolo harmonica with stainless steel reeds and Richter-tuning. The SAILOR STEEL Tremolo is available in the keys of C, D and G major, as well as in A and E harmonic minor. Harmonica Seydel Fanfare Tremolo Key of Bb. The Fanfare is a Tremolo harmonica that is optimized for air-tightness and therefore can be played with an easiness and sonority that is unusual for a Tremolo harmonica.